Gazelles are a genus (Gazella) found in the antelope family, six species of which can be found throughout Africa. Many of these small, horned creatures are endangered, and their populations in the deserts, plains, and savannas of Africa are threatened due to hunting, farming, and loss of habitat. The most common gazelle in the Sahara desert is the Dorcas gazelle (Gazella dorcas), with several subspecies residing throughout northern Africa and the Middle East as well. The appearance of these gazelles can vary by subspecies, and ranges fawn to reddish-brown coats with stripes on the flanks and face in several shades of brown and white. They stand up to 2 feet tall and can weigh up to 44 pounds. Dorcas gazelles are highly adapted to desert life, and are able to get all required moisture from their plant matter-based diet without ever taking a drink of water. While these gazelles are not endangered, their population is considered vulnerable due to illegal hunting and habitat loss, caused by land development and agriculture. Grant's gazelles (Nanger granti) are named for explorer James A. Grant, who discovered the source of the Nile with John H. Speke in 1862. These large gazelles stand 65 inches high and can weight up to 147 pounds, with pale brown coats and a white patch above their tails, similar to Thomson's gazelles. They are found in the savannas, deserts, and plains of east Africa, and are not considered threatened or endangered. Slender-horned gazelles (Gazella leptoceros), also known as Rhim gazelles, are easily distinguishable by their pale brown coats and long, slender horns. In males, the horns can reach up to 16 inches, while in females the horns may grow only to 13 inches. Rhim gazelles were once the most common gazelles in the Sahara, but are now endangered due to loss of habitat and recreational hunting. Small numbers of these gazelles can now be found in Algeria, Chad, Egypt, Libya, Mali, Niger, Sudan and Tunisia. Speke's gazelle (Gazella spekei) is named for John Hanning Speke, a British Indian Army officer who led several explorations of central Africa. This gazelle has a distinctive nasal sac that can be inflated when the gazelle is threatened or excited. They have fawn-colored coats, with white underparts, and brown stripes on their flanks and faces. While males and females have horns, males always will have longer horns than the females, with an average of 11.4 inches. Speke's gazelles are endangered in their natural habitat of Somalia, and are now extinct in Ethiopia. Thomson's gazelles (Gazella thomsonii), which are named for Scottish explorer Joseph Thomson, are found in the savannas of east Africa, and are most common in the Serengeti region of Kenya and Tanzania. These gazelles stand up to 26 inches high at the shoulder and can weigh up to 55 pounds. Their coats are light brown, with dark stripes on their sides and white patches just above the tail. Male Thomson's gazelles have horns, while females may or may not. Their diet consists of grass and seeds, and they are hunted by a variety of predators, including cheetahs, leopards, lions, hyenas, and humans. This is the largest of all gazelles, standing 3.9 feet tall and weighing up to 165 pounds. There are several subspecies of Dama gazelle (Nanger dama), and their coloring can range from reddish-brown with white patches and stripes, to a completely red-brown coat. All subspecies have slender, S-shaped horns. These gazelles are considered critically endangered, having suffered population decline due to desertification and over-grazing of their natural habitats, as well as civil unrest in their native range of Monoco, Senegal, and Mauritania to the Sudan. They now are found only in Chad, Mali, and Niger. Soemmerring's gazelles (Nanger soemmerringii) are named for Samuel Thomas Soemmerring, a German and Polish scientist. These gazelles stand up to 3 feet high and weigh no more than 99 pounds, with a tawny red coat and white underbody. Their horns can grow up to 1.9 feet in length in males, and 1.3 feet in females. Soemmerring's gazelle is found in the steppes of Ethiopia and is classified as vulnerable by the IUCN. The red-fronted gazelle (Eudorcas rufufrons), as its name suggest, has a red upper coat, which is separated from a white underbelly by a thick black stripe on the animal's side. Males and females have horns, which can reach up to 9.8 inches long in females and 13.7 inches in males. Unlike many gazelles, the red-fronted gazelle do require water occasionally, rather than gaining all needed moisture from their plant-based diet, and migrate seasonally during the wet season. They are considered vulnerable by the IUCN due to illegal hunting in their natural range of the Sahel, a narrow semi-arid zone stretching from North Africa's West coast to the Red Sea. Cuvier's gazelle (Gazella cuvieri), sometimes known as Atlas or mountain gazelles or Edmis, are two toned, with dark brown upper bodies and backs, and white underparts, and black facial stripes. Male and female Cuvier gazelles have spiral horns that can reach up to 13.7 inches in length. These gazelles are considered endangered, with the most significant threat coming from hunting in their natural habitat of the Atlas mountains. The springbok (Antidorcas marsupialis) is the national animal of South Africa and prefers to dwell in open plains, deserts and savannahs. They have distinctive coloring, with cinnamon colored upper bodies, white bellies, with a white crest running along their backs. The males and females have lyre-shaped horns, with the horns of males being much thicker than those of females. They are not considered threatened by the IUCN, and are classified as Least Concern. Gerenuk (Litocranius walleri), also known as Waller's gazelle, means "giraffe-necked" in Somali, a reference to this animal's long, thin neck. Like a giraffe, the gerenuk stretches its neck to reach leaves high in the branches of trees. Male gerenuks have S-shaped horns, while females do not. They are found from southern Djibouti, Somalia and Ethiopia, and from Kenya to eastern Tanzania. They are considered Near Threatened by the IUCN due to habitat loss and agricultural expansion. 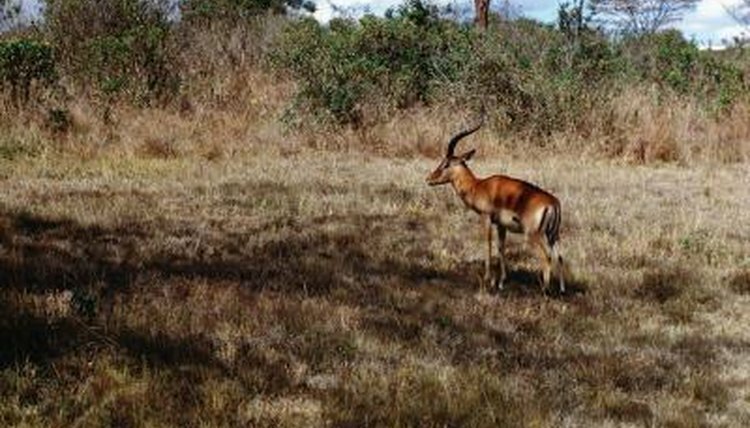 The dibatag (Ammodorcas clarkei) also is known as Clark's gazelle. In Somali, dibatag means "erect tail"; this gazelle holds its tail high and waves the tail as it walks. They stand up to 2.83 feet tall and weigh up to 77 pounds, and are found primarily in Ethiopia and Somalia, where they were declared endangered in 1996 due to poaching, habitat loss as a result of droughts, and agriculture. Populations in Ethiopia, where it is illegal to hunt dibotags, are stable. What Is a Close Relative of a Yak?